Powers/Abilities: Lance is an exceptional shot, able to shoot arrows out the air, and a master with the thrown knife. He is an excellent horse rider. History: (Texas Kid #1-10, Two Gun Western v1 #8-9, Wild Western #23-25) Zane Temple had been a Texas Ranger who had retired following the Mexican-American War of 1846 to become a rancher near the border town of Caliber City. 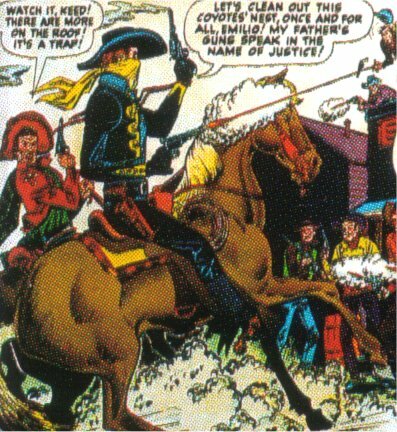 He and his family lived a peaceful life until the day outlaw Link Cado and his gang came to town, seeking revenge on the Ranger who years before had sent them to jail. They attacked the Ranch and slew Lucy Temple, Zane's wife; Zane retaliated, killing many of them before Link shot him in the back. Lance tried to fight too, but Link shot the gun out his hands and was about to finish him off when two of Zane's friends, Emilio (a Mexican) and Red Hawk (an Apache) arrived and scared him off. Though Red Hawk managed to save Zane's life, the former Ranger was permanently blinded. Emilio and Red Hawk vowed to look after both of the Temple men, and help them work the ranch. As Lance grew, they tutored him in ranching, hunting and fighting, so that he became an expert in each. Reaching adulthood, Lance sought to hunt down Link, but his father made him swear to forebear violence and seek peace instead. Rather than disappoint his father, Lance decided to create a new identity so he could fight anonymously. 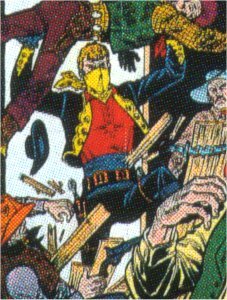 He was supported by his two other friends in this venture, with Emilio giving him a costume he had worn as a young caballero, and Red Hawk gifting him a horse and Winchester rifle. Lance became the Texas Kid, and rode the range in the service of justice.